Top-of-the-line, $80 gloves are great if you get them as a gift from some rich uncle, but for most of us that's not going to happen. Don't get me wrong; high-end equipment is an investment and provides a lot of protection for motocross riders who need it. If you ride pro or every second of free time you have, shell out for the best, otherwise you can probably settle for middle-of-the-road and a $20 price tag, like MSR Racing's Renegade motocross gloves. Designed with grip position architecture, the Renegade glove is constructed of dimpled mesh fabric on the back and fingers with a padded nash palm. The reinforced thumb and palm resist abrasion, and the injected rubber logos protect from impact. Lycra panels on the sides of the fingers and at articulation points allow for flexibility without sacrificing the protection provided by the stiffer material of the shell. Airprene cuffs offer comfort and non-slip stability. Renegade gloves do lack a few features that have become popular for motocross riders, such as a carbon fiber knuckle protector and a longer wrist panel. 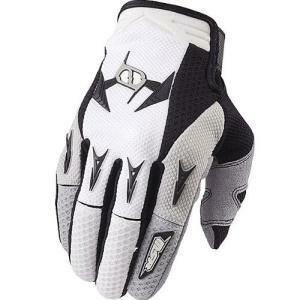 These do fall shy when it comes to impact resistance, as the rubberized logos are on the fingers but not the knuckles. All in all, you get a lot for the cost. Being mid-grade, you can't expect everything but you will get a good fit and a pair of gloves made with motocross in mind. The Renegade gloves come in youth and adult sizes in blue, red, orange, gray, and slate.